Poland's Galeon continue to challenge the market with innovative projects, and its next novelty is the 550 Fly model. The 550 Fly is again a design from keel to top by British designer Tony Castro, now responsible for nearly all new Galeon models as presented after 2005 by the Strazyn located boat builder. The 550 Fly will be in my understanding a future replacement of the 530 Fly, although Galeon does like to leave the previous successful models in production for a year before actually phasing them out. The 550 Fly is a very complete motor yacht with a clever layout, and a sea kindly hull making it able to challenge any similar sized style flybridge motor yacht in the market today. Both the flybridge and the aft deck will offer premium sizes for a seventeen meter motor yacht, and the lower deck is among the most spacious in this size. Here a three cabins layout with full beam owners stateroom, VIP suite to fore, and double guest room is to be found. To aft will be a cabin with two single berths and a shower head, serving the crew or extra guests. This can also be replaced with a tender garage, a very hard to find feature on a flybridge motor yacht under sixty feet in size. As recent Galeon models the 550 Fly continues the theme of a natural light filled interior thanks to huge windows found in all the areas from the cabins to the main deck. 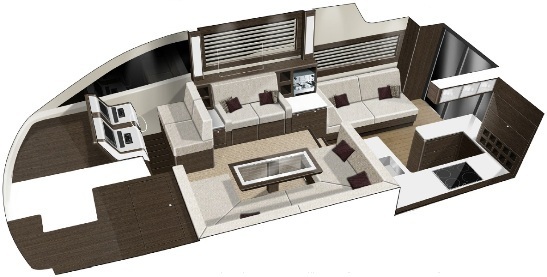 Another clever feature for the 550 Fly will be the astern galley in the split level saloon which thanks to the swivel patio door also serves the aft deck. This along with the choice of the tender garage aft represent the design hall marks of the 550 Fly. Power will be from twin MAN or Volvo engines with in line shaft propulsion, but Galeon also advises that a lot of study has gone to make the 550 Fly with an exceptional low center of gravity which offers better stability in rough sea conditions. Galeon 550 Fly is a wonderful yacht.Its interior is so attractive.It is so luxurious.